The Sainsbury Gallery at the Willis Museum will be immersed in a kaleidoscope of rainbow lights as artist Liz West brings her exhibition, The Light Room - Your Colour Perception, to the Hampshire Cultural Trust venue on November 7. Liz creates vivid environments that mix luminous colour and radiant light. She is interested in exploring how sensory phenomena can invoke psychological, physical and emotional responses that tap into deeply entrenched relationships to colour. This exciting artist, who has exhibited both nationally and internationally, will transform the Sainsbury Gallery into a magical rainbow of light for visiting art lovers to wander through. The experiential exhibition will invite visitors to question their reactions to the intensity of light and colour. Liz will individually wrap each lamp in coloured filters to create the vast rainbow effect in the gallery. Liz said: "My interest into the science of light and colour is ongoing and has been integral to all of my works in the last couple of years, even the work I made on my degree was steeped in rich colour mixing and awareness. Colour can conjure long forgotten memories in the same way that other sensory experiences, such as certain smells or sounds, can be reminders of vivid past events. "I find that reactions differ depending on age. In the past as young people entered the space they immediately took the opportunity to run as fast as they could from one end of the room to the other!" "We're delighted to be exhibiting Liz West's extraordinary art at the Willis Museum's Sainsbury Gallery. It’s a truly immersive experience that visitors will lose themselves in. Liz's work has been recognised as world-class and we're proud to be bringing her to Basingstoke." Liz graduated from the prestigious Glasgow School of Art in 2007 and has exhibited around the UK and abroad. Her work has been recognised in international awards and this year she was one of just 10 artists to win a RBS Bursary Award from the Royal British Society of Sculptors. 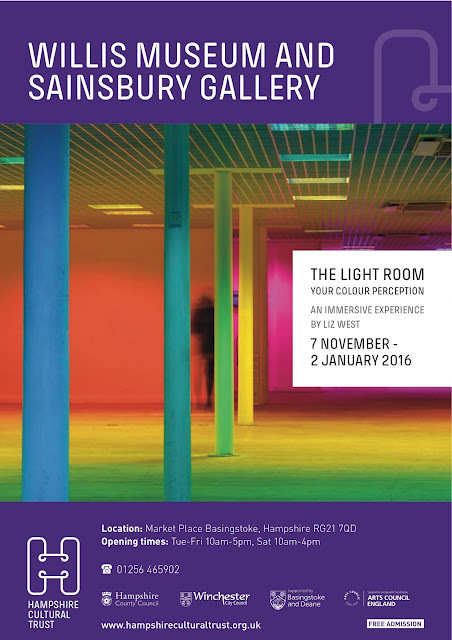 The Light Room - Your Colour Perception will be at the Sainsbury Gallery until 2 January.